Discussion in 'Community Workshop' started by Adam Jonas, Sep 13, 2015. I started to produce setups for public use - so down below you can see some setups I used and/or used during the different competitions. Some of the have some onboard footage too - maybe it can be useful some of you to watch my lap and try improve your fastest lap and driving style as well. Let me know if you like it and for which track/car combination you want to see setups, or if you simply curious about some stuff, feel free to ask anything in this topic. How to use: simply just click on the name of the car. You will see a spreadsheet for that car, with different tabs on the bottom. Each track has a different tab where a setup exists. You can find my onboard videos here. I added my PB laptimes, and some onboard footage at some track. Thanks Adam! Instead of screen shots, cant' we upload the "svm" files? Like that we can just download and copy it to our CarSetups folder I guess. Well, it doesn't depend on me. You have only one slot for a setup, and I don't know if the copy&paste method would work fine. your downshifting profs once again that r3e is still far away from a close to reality simulation. Should be called Arcade Competition, nothing to do with get real. @Jimmy Cliff -your title should be 'Dis'- member. It ain't the best, but it's the best FREE TO PLAY game out there. You should go back to spending time on your Monster Truck models...I'm glad to have a place to race that's within my budget constraints...you know, budget. Things adults do when they're not racing within their means. And, @Adam Jones, thanks for the set-ups. I'm really looking forward to trying these... is it car specific? I AM a neewb, ya know. Yeah, it's car-specific, but with a little change, you can use it with other brands as well. hm, but would the setups work with the new Physics in DTM15? To be honest, I don't own any cars of the DTM '15 pack, so I don't know. I found that they pretty much work for all cars, FW or RW. Set-ups are highly individual, and you only find out by trying it. 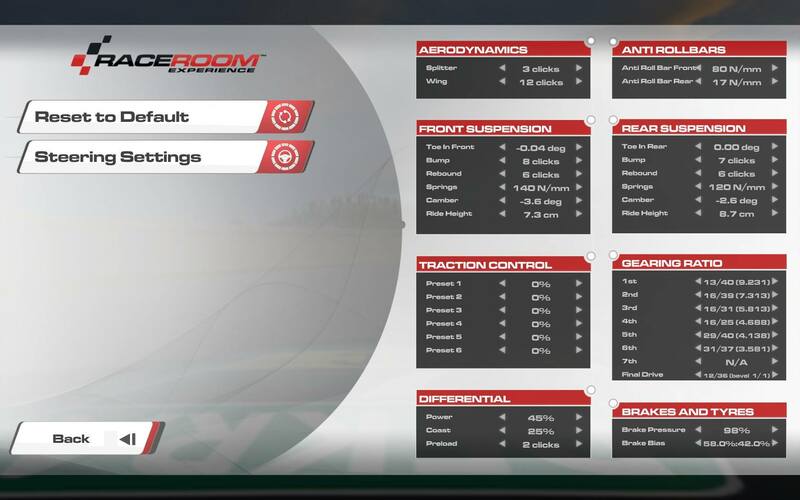 Adam's work for me on all the free cars, with a tweak of the camber on the left front for FW. Bumping up the preload on the higher-horsed RW cars tames the throttle response for me. Pretendracecars has a generic set-up for RW that's real close to this. It's easily adaptable to FW, too. It really is impressive to watch these very fast laps but one thing that niggles me is how things start to look unrealistic once you get lap times so fast that you start to outperform what the car could do in the real world. It's great in game driving skill, no doubt about it, but it just looks wrong in an arcadey type of way. Full lock, full throttle, multiple downshifts with brakes fully on whilst drifting sideways... stuff you would never get away with in a real car. I hope I'm not coming across to negatively because again, the driving really is clever and at a level I cannot personally match. It just doesn't look real to me. Believe it or not, but I agree with you. To be honest, when you are trying to set the fastest lap times, usually you don't care with these things. You justr try to push the last possible thousand of a second which is in yourself and in the car. The perfect settings for these hotlaps would be the turned on mechanical damage & tire wear. And competitions should be hold with these settings as well - but that's my own opinion. Well, about sideways...I think you can do it with real cars, only not that spectacular way you can see in my videos. Yesterday I tried the Spa - ADAC GT3 '15 competition, and I made a Bentley setup. I'm going to upload this setup in the Car Setups topic.